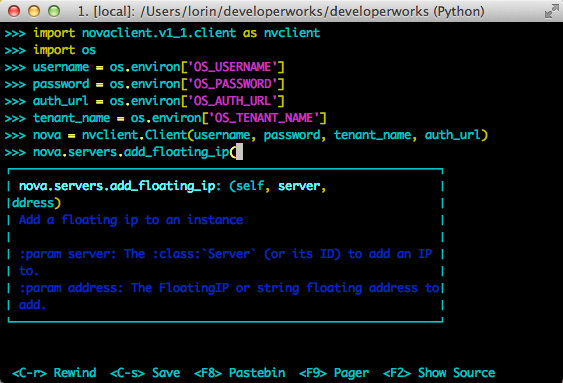 OpenStack Cloud Tools Python Packages are quite easy to install python using the pip command. We have shown how to install for Linux server. We talked about OpenStack before and here is a comprehensive guide for the beginners. pip command is a nice tool for installing and managing Python packages. It is a sort of replacement for easy_install for Python packages. pip is very useful for web development as well as for system administers who manages resources created on Openstack be it on Rackspace or other cloud computing service providers. Please note that, pip for all users requires root privilege but pip for a single user does not require root privilege. Usually people uses virtualenv script. You will find the usage of virtualenv script for using various command line tools developed for Rackspace Cloud Files, Cloud Server. These are the basics you need to know for using OpenStack Cloud Tools Python Packages. You can see an example usage of virtualenv script in the following situation. Again, this example is not related to OpenStack Cloud Tools Python Packages. ftp-cloudfs - FTP interface to Rackspace Cloud Files and OpenStack Swift vaporize - A clean and consistent library for the Rackspace Cloud / OpenStack openstack.nose_plugin - openstack run_tests.py style output for nosetests nova-adminclient - client for administering OpenStack Nova python-glanceclient - Client library for OpenStack Image API python-novaclient - Client library for OpenStack Nova API. python-quantumclient - CLI and python client library for OpenStack Quantum python-melangeclient - Client library for OpenStack Melange API. txAWS - Async library for EC2, OpenStack, and Eucalyptus python-swiftclient - Client Library for OpenStack Object Storage API python-keystoneclient - Client library for OpenStack Keystone API django_openstack_auth - A Django authentication backend for use with the OpenStack Keystone Identity backend. python-cinderclient - Client library for OpenStack Cinder API. rackspace-auth-openstack - Rackspace Auth Plugin for OpenStack Clients. openstackocci - OCCI interface for Openstack. django-openstack - A Django interface for OpenStack. futuregrid_passwdstack - Password Stack is a simple tool that allows normal users to reset their own password in the OpenStack Dashboard cloudenvy - Fast provisioning on openstack clouds. reddwarf - PaaS services for Openstack python-openstackclient - OpenStack command-line client reviewday - Report generator for OpenStack code reviews. horizon - The OpenStack Dashboard. hpcloud-auth-openstack - HP Cloud Auth Plugin for OpenStack Clients. python-novaclient - Client library for OpenStack Nova API. python-melangeclient - Client library for OpenStack Melange API. django_openstack_auth - A Django authentication backend for use with the OpenStack Keystone Identity backend. python-cinderclient - Client library for OpenStack Cinder API. rackspace-auth-openstack - Rackspace Auth Plugin for OpenStack Clients. openstackocci - OCCI interface for Openstack. django-openstack - A Django interface for OpenStack. cloudenvy - Fast provisioning on openstack clouds. reviewday - Report generator for OpenStack code reviews. horizon - The OpenStack Dashboard. hpcloud-auth-openstack - HP Cloud Auth Plugin for OpenStack Clients. Now, like the example with horizon, you can use easy one line command to install the tool you need. This Article Has Been Shared 2149 Times! Cite this article as: Abhishek Ghosh, "OpenStack Cloud Tools Python Packages," in The Customize Windows, November 22, 2013, April 21, 2019, https://thecustomizewindows.com/2013/11/openstack-cloud-tools-python-packages/.